U.S. Marshalls have tracked a fugitive and his suspected female accomplice across the western United States - from Arizona to New Mexico to Wyoming - and are now focusing near Montana's Glacier National Park. The search for inmate John McCluskey, 45, and Casslyn Welch, 44, has shifted from sprawling, tourist-packed Yellowstone National Park, which straddles Wyoming and Montana. But the U.S. Marshals Service said late Monday it has received tips from the area east of Glacier National Park near the Canadian border. "There has been a lot of activity in the area," said Fidencio Rivera, chief deputy U.S. marshal for the district of Arizona. "That is one of a few places we are looking at." Authorities say McCluskey and Welch think of themselves as a Bonnie and Clyde starring in their own crime caper, reports CBS News correspondent Ben Tracy. Inmates McCluskey, Tracy Province and Daniel Renwick escaped from a private, medium-security Arizona State Prison near Kingman on July 30 after authorities say Welch threw wire cutters over the perimeter fence. Welch is McCluskey's fiancee and cousin. Renwick, who turns 37 on Tuesday, was captured in Colorado. Province, 42, was caught Monday as he walked in Meeteetse, Wyo., steps from a church where he sat in the pews a day earlier. He was scheduled for an extradition hearing Tuesday morning, authorities said. Efforts to find McCluskey, Province and Welch intensified after they were linked to a double homicide in New Mexico, with the case airing on "America's Most Wanted." On Sunday, Province walked into Meeteetse Community Church, about 60 miles (100 kilometers) outside of Yellowstone, wearing jeans, a blue checkered flannel shirt, and a backpack, looking like a hitchhiker, worshipper Jay Curtis said. Province closed his eyes and sang along with the band. A woman who had chatted briefly with Province on the steps of the church on Sunday called police after recognizing him later on television, Gonzales said. Gonzales said a $40,000 reward was set for McCluskey and Welch's capture. "Rest assured, we are going to be on McCluskey like a cheap suit," Gonzales said. "We are not going to pull this thing down." The Arizona Attorney General's Office on Monday charged two women, including McCluskey's mother, with helping the inmates after they escaped. 2 Escaped Inmates at Large, 1 Caught in Colo. Province was serving a life sentence for murder and robbery out of Pima County, Arizona. McCluskey was serving a 15-year prison term for attempted second-degree murder, aggravated assault and discharge of a firearm. Renwick had been serving a 22-year sentence for second-degree murder. He was caught Aug. 1 in Colorado. Forensic evidence linked Province, McCluskey and Welch to the killings of an Oklahoma couple. New Mexico State Police spokesman Peter Olson declined to elaborate. The badly burned skeletal remains of Linda and Gary Haas - both 61 and from Tecumseh, Okla. - were found in a charred camper Wednesday on a remote ranch in eastern New Mexico. Their pickup truck was found later 100 miles west in Albuquerque. Authorities believe the two inmates and Welch went to Wyoming, where Province separated from McCluskey and Welch at the southern entrance to Yellowstone. By Monday, rangers at the park were given posters of the fugitives so they could check passing cars for them. But they weren't handing out the posters. Officials said the 3,472-square-mile park was safe, as they welcomed an estimated 30,000 campers and tourists. 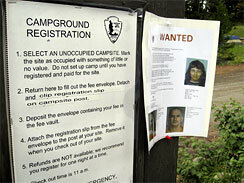 Wanted posters were put up at campground registration areas with pictures of the two fugitives warning: DO NOT APPROACH. More than 100 law enforcement officers are looking for fugitives and have vowed to stay on them "like a clean suit," Tracy reports.